With an ever increasing need to launch products to the market faster and the growing popularity of the agile methodology that insists on continuous testing, enterprises today need to invest in implementing automation testing. There are several benefits that automation testing can bring to your testing process, and the primary ones include increased efficiency, faster and more accurate results, and maximized test coverage, among others. The new age test automation tools come with several advanced features to meet the varied testing goals of organizations. While these features are designed to make the process of automation testing easier, different software applications have different requirements when it comes to testing, and so it is important that you choose your tool wisely in order to experience high testing performance. 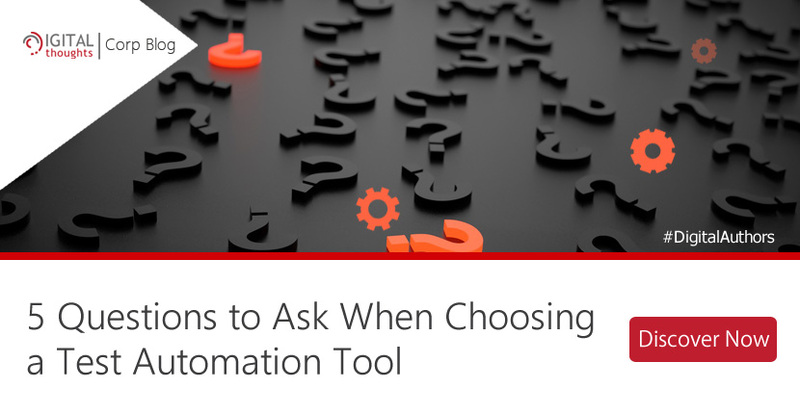 Here are 5 questions you should find answers to in order to make an informed decision when it comes to selection of the right tool. 1] Which are the programming languages your team is experienced working with? Different advanced test automation tools are designed to support different programming languages and so it is really important that you choose a test automation tool your team will be most comfortable working with. Tools based on the Selenium framework are recommended here because Selenium supports an array of programming languages, including Python, Java, PHP, Perl, among others. You should take into account the fact that switching to automation testing involves a learning curve already and it’s easier if the tool supports the programming language your team is familiar with. 2] What are the testing requirements for the project you’re working on? Before you go ahead and invest in an automation testing tool, it is important to analyze your testing goals. After all, unless you are aware of what you want the test automation tool to do for you, how are you supposed to make the correct choice? Once you know what to expect from the automation of the testing process, look for a test automation tool that is designed to meet your needs. For example, if your project is primarily about mobile application testing, you would need a different tool than that required by a QA team focusing on web application testing. 3] Which platform(s) or browser(s) you want your tool to support? Now, this one is important because not all projects have the same requirement when it comes to the number of browsers and platforms that need to be supported. While some projects need to focus on a handful of browsers, others may have to take several browsers and platforms into account. And since complex testing can be expensive, you need to be clear about the extent of support you need your testing tool to offer. If your project requires extensive testing on multiple browsers and platforms, you should invest in a tool that offers cross browser, cross platform support. 4] Are there any specific external integrations that you seek in your tool? Advanced test automation tools today support seamless integration with an array of other tools, and each of these integrations are designed to add to the functionality and capability of the tool. So, you have Sauce Labs, BrowserStack, BrowseEmAll and other integrations and so it is important to analyze each integration and its functionality to know which ones can serve your purpose. Once know what you want, it will be easier to choose a tool that meets your requirements. 5] How much do you intend to invest in test automation? Last but not the least, you should come with the amount you want to invest in a test automation tool and then stick to this budget when hunting for one. After all, there are several tools out there that offer really amazing features but sticking to a budget is important. The trick is to find a tool that offers all the features you seek and at the same time, falls within your budget. To find the answers to the questions above, you need to speak to your QA team and also discuss things with the management of your organization. Once you have the answers, you will be better equipped to choose a tool that offers you the many benefits of test automation and help your QA team achieve the testing goals you had set out to achieve in the first place.